Welcome to the final "Week in Review" for 2016 and for the foreseeable future. I've had a good run of 52 weeks of summaries but have come to the conclusion that a weekly review is probably a bit much. It's also starting to feel like a bit of a burden and has ended up being published later and later into the subsequent week as the months have moved on. From January 2017 onward I think I'm going to switch to doing a monthly review and see how it goes. Right, back to this week. Thanks to Christmas and all the excesses that go with it, there wasn't much in the way of running this week. I went out for a medium long run on Tuesday as I really needed to get out after being stuck indoors for the whole of the Christmas weekend. The only other run I did was on new year's eve in the form of The Gut Buster 10 Mile. This was a great muddy challenging run out in the Berkshire countryside. I started off nice and relaxed and took advantage of the tarred roads in the early part of the race to work my way up into third place. I kept up a good pace whilst continually trying to reel in the second place chap but every time I thought I'd gained a bit on him, he pulled away from me again. I kept this going right through the muddiest and slippiest sections in the second half of the race until the final mile when I finally caught him, had a little exchange and pulled ahead. I finished strong in what I'd calculated as second place, but alas I didn't get a second place goody bag when I crossed the line. A bit confused I went to the computer to check and it had me finishing third and second in my gender. Huh!? A few other peeps were a bit confused by this especially the guy who came first ("second" according to the computer) in a tremendously fast time of 52:15 which surprised him - he suspects he may have been sent the wrong way or missed a turn at some point. I didn't hang around too much longer as I was starting to get cold so claimed my bag and got on the bus back to the park & ride. On the way I checked the results again and they had me second, behind the guy who I thought came first. By the time I got home I was in first place with the original first place guy now under query. Sadly this confusion meant I haven't got a prize yet, but I'm sure they'll sort things out in time. The win is nice to have but there's no way I would have caught the guy ahead of me so I'm happy with 2nd if that's what I get in the end. 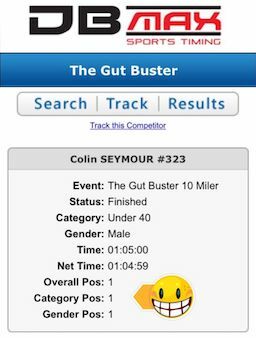 I'm not sure if there's a series prize but if there is, I think I may be in a good position for first with 7th at the Mapledurham 10M, 2nd at the Muddy Welly 10k and now 1st/2nd at the Gut Buster 10M. Another thing we'll have to wait and see about. On a different note, I didn't eat anything for breakfast beyond my usual bulletproof coffee and I can say I didn't miss breakfast at all. The bulletproof coffee gave me all the energy I needed. And that closes off my final week of running in 2016. I'm working on a 2016 in summary post in which I'll highlight my training, racing and diet as I've in the past, so watch this space.